I've been allowing common milkweed volunteers to grow in my garden for eight years, hoping to encourage Monarchs to reproduce here. 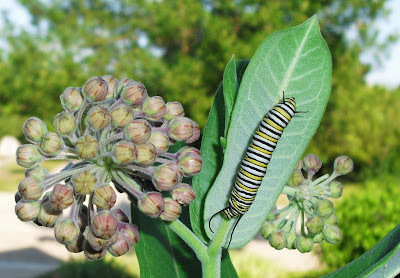 This is first year they've ever produced flowers, and the first year I've seen a caterpillar, even though we do get a fair number of Monarch butterflies. Front Garden. 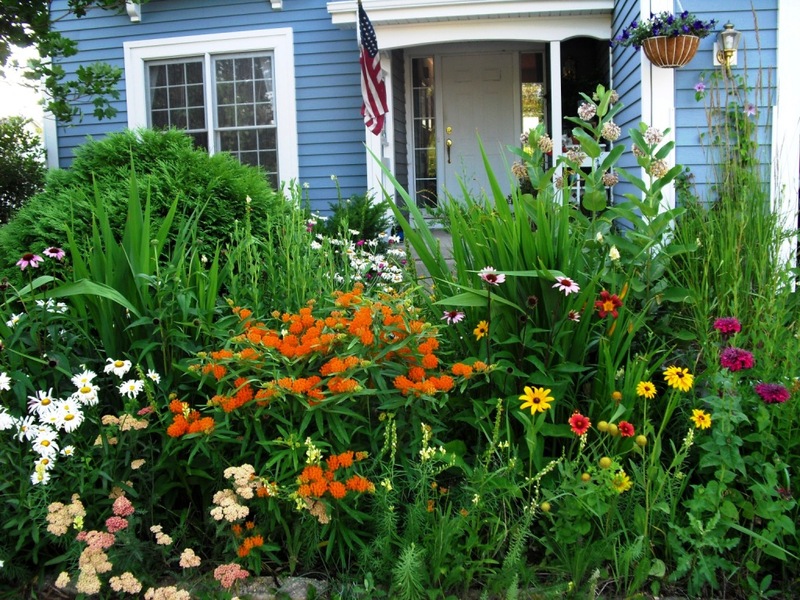 The tall plants in the rear, just to the left of the hanging basket, are the Milkweeds. 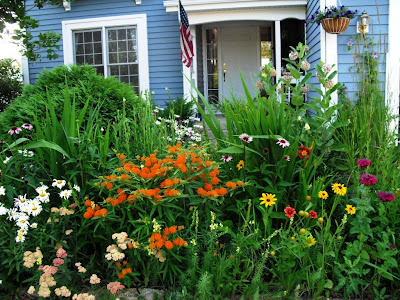 The orange flowers in front are Asclepias tuberosa, (butterfly weed) which also attracts Monarchs. The two-year old bed at the foot of the right side of our driveway really came into its own this year. 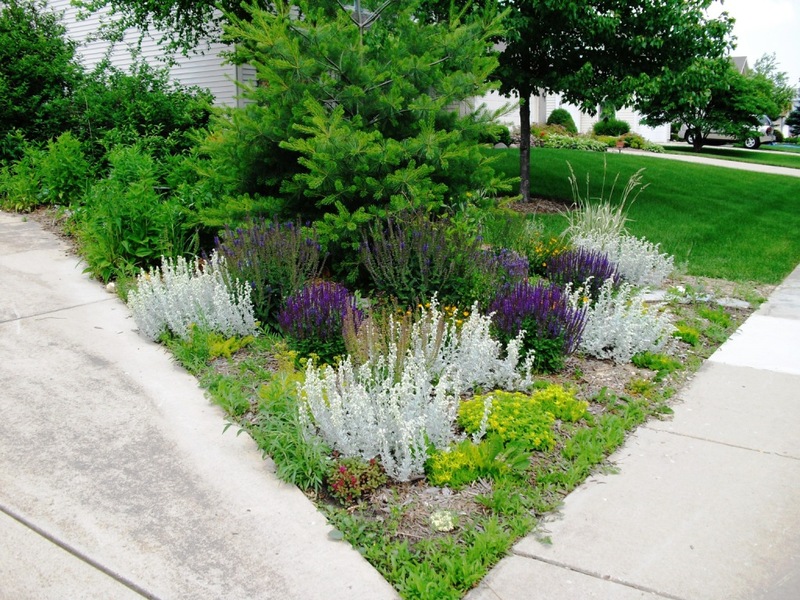 The gray plants are Artemesia stelleriana 'Silver Brocade,' the purple spikes are Salvia nemorosa 'East Friesland' and Salvia x sylvestris "May Night." 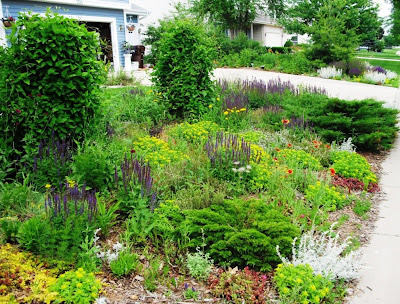 This is the more mature garden to the left of the driveway at the sidewalk, filled with Salvia, Sedum, Sempervivum, Gaillardia and Juniperus, not to mention the Clematis-covered trellises. 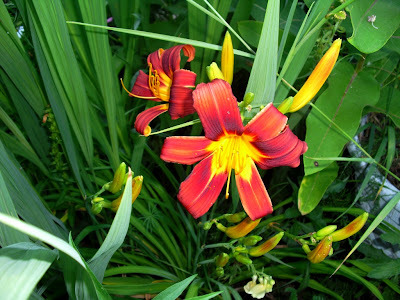 The new backyard garden I planted last year has really taken off, and I will be featuring it in an upcoming post. Thank you! Plain lawns with a few foundation plantings are the order of the day here. Bob and I are sure that our neighbors don't know what to make of us. OMG! Your yard is a standout in your neighborhood!!! It is so lovely!!! I am seriously impressed!!! Makes me want to do more!!! Long time no comment! 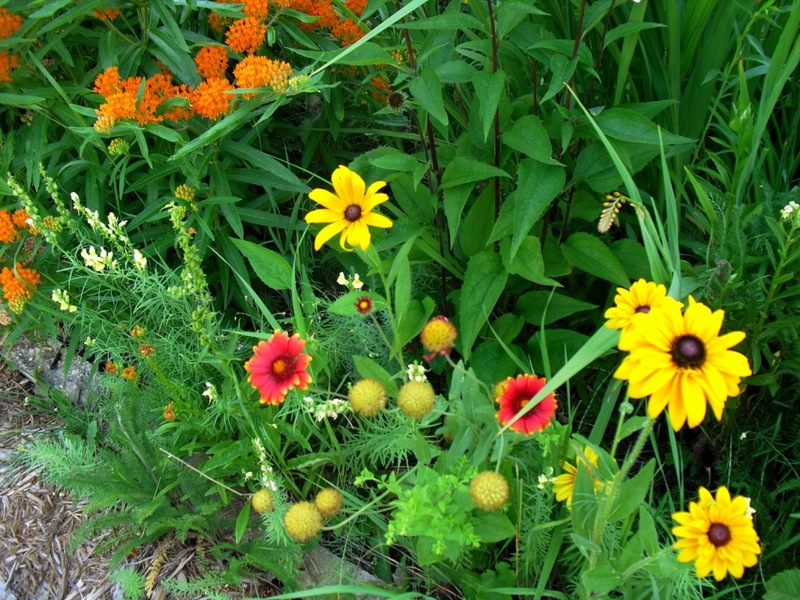 Wow, there are some flowers there, especially that Echinacea, which would look beautiful anywhere, but look best in your garden. And Kate and Will said not to worry - they're fine with a glazed doughnut and a cup of joe. Thank you. It's great to hear from you again. That's a beautiful flower garden of yours. So gorgeous! I love to stay on your garden at least for a day just to feel that I am in a paradise. I really like it so much and those tiny colored flowers are so perfect.